Tunnel Barn Farm is the Midlands premier fishery offering day tickets for pleasure fishermen and daily competitions for match anglers. Located in the picturesque village of Shrewley in the heart of the Warwickshire countryside, our fishery is made up of 9 unique pools. We have been open to the public for over 20 years and stocks tens of thousands of fish including many varieties of carp, chub, tench, bream, roach, perch, etc. Each pool ranges in size and style and giving you over 300 pegs to choose from. Each peg has been designed to give anglers something to fish to. There are a number of designated disabled pegs and for those that require assistance reaching their pegs a member of staff is always on hand. Our onsite tackle shop has been expanded and stocks virtually all types of bait and tackle. For example we have poles starting from £30, landing nets with handles from £10 and keepnets from £20. For more information on the tackle shop please call 01926 842188 and our staff will be pleased to assist you. We also have an excellent Café and clubhouse on site providing breakfast and food throughout the day which can, if required, be delivered to you at your peg. Advice on how to fish the complex is always available from the guys in the shop. We pride ourselves on being one of the top angling venues in the country and regularly attract big matches such as Fish-O-Mania qualifiers, Maver Match This qualifiers, Garbolino Club Angler of The Year qualifiers and we have hosted the Super Cup Final for the last three years. We have also held corporate events for a number of companies including, Ibstock Brick, Cromwell, Argos, Severn Trent, the RAF, MOD, the Fire Service and the Royal Navy. We also hold our own Winter League which is attended by some of the top anglers in the Midlands including England internationals. This league is extremely popular and sells out within weeks of the dates being announced. We are able to cater for any size of match from a knock up with a few mates to corporate days of more than 200 anglers. Our on-site accommodation consists of 2 country log cabins, our Fisherman's Rest as well as caravans. From a one night stay to long stay fishing holidays, we cater for large groups as well as single occupancy. Please read more on our accommodation page HERE. PLEASE NOTE THAT ALL OPEN POOLS ARE SUBJECT TO CHANGE & CONFIRMED ON THE DAY. We are running our usual mini optional festival over the Easter weekend. £20 to enter and the best 2 weights over the 4 days will be counted. Matches will be run as a normal open, with a pay-out at the end of each day. advantage baits now in stock! Fish ‘O’ Mania, now over a quarter of a century old, is one of the great summertime sporting occasions. Known as the ‘FA Cup of Fishing’, the competition involves 24 anglers who have qualified through heats across England and Europe, fishing off for a massive £50,000 first prize. July 2019 sees the record-breaking 26th edition of the world's No.1 coarse fishing match. Televised live from start to finish, the competition has been a regular fixture in the British sporting calendar since its inception in 1994. Broadcast for 5 1/2 hours live, Sky Sports give fishing the big-time makeover as their big budget state-of-the-art production highlights fishing in a way unrivaled in televised sport. The event gains much of its excitement by abandoning the traditional weigh-in at the conclusion of the match, and instead features weigh-ins every 30 minutes which gives the event a changing leader board that makes the action easy to follow. Fish’O’Mania was a success from the start as the inaugural event at Mallory Park was won by Ian Turner of Worksop. With 22 qualifying matches across England starting in the spring, a total of 2,600 anglers enter but there will be only one winner who takes home the £50,000 top prize. We are excited to yet again be hosting Fish-O-Mania Qualifiers, the first match held at Tunnel Barn Farm on 16/03/19 was won by Jamie Hughes with a weight of 146 lbs 03 oz - WELL DONE, Jamie! 1st June 2019 sees the next Fish-O-Mania qualifier here at Tunnel Barn Farm - Tickets are only available from the Angling Trust Website HERE. Please note: Anglers must have individual membership of the Angling Trust available on 0343 5077 006 (option 1) or on the Angling Trust website click here. Anglers are also reminded they must be 16 years of age and above in order to take part in the main event. An exciting new winter pairs festival took place here at Tunnel Barn Farm on the 10th and 11th of December 2018. Organized by Catch More Media, the event attracted backing from Daiwa and saw 7 pairs compete for a range of prizes. Huge congratulations to Callum Dicks and Sam Collett on becoming the first ever Daiwa Winter Pairs champions! Their total weight over the two days was a fantastic 258-4-0. Runners up Jordan Holloway & Kristian Jones put in a fantastic day two performance which saw them take runner up spot with 246-5-0. Thank you to Catch More Media, Daiwa and the anglers who took part in this great event. We look forward to reading the write-ups soon but in the meantime have a look through the photos and watch the highlight video put together by Catch More Media. One of the UK’s richest, and best supported commercial fishing festivals. 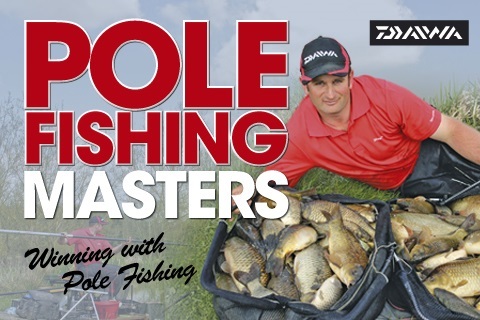 Held annually in June, the Daiwa Pole Fishing Masters takes place at the Tunnel Barn Farm complex near Warwick, and boasts one of the biggest festival payouts in match fishing. Thanks to generous support from sponsors Daiwa, the winner walks away with £3,000 cash plus a flagship pole - usually worth in excess of £3,000. For match, club or pleasure fishing Tunnel Barn Farm has it all. ​A days fishing at Tunnel Barn Farm is a day’s fishing you will never forget.